If you could build a robot to change the world, what would you build? That was the question posed to a group of Girls Inc. middle school students on a field trip to Cloudera, a software company in San Francisco. The trip was facilitated by Give to Get as part of a Global Day of Service, and the girls built robots and learned how they are programmed. They were given the task of thinking of a global issue the robot could help solve with its functions. One of the highlights was a group of two 7th grade girls (Arendi and Naydelin) who designed their robot to help refugees from Sudan relocate to camps in Kenya. 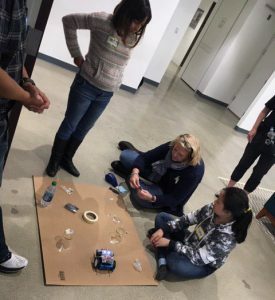 They decided to have their robot help transport and clear a safe path for refugees because they had been learning about this issue during school. They explained to their group of adults what the crisis was, and even helped make a map for the robot to follow. It is clear they have the curiosity, the intellect, and the drive to change the world. Girls Inc. is grateful to play a part in their journey as they reach for the stars.